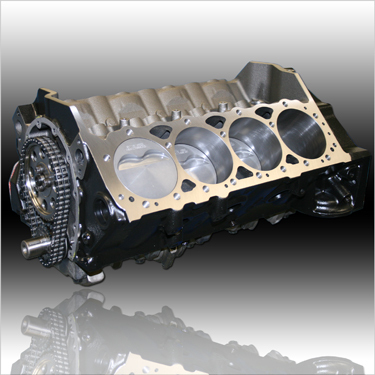 The Same Shortblock That We Have Been Using In Our Popular 427 RealStreet Engine Is Now Available Separately! (2) 3.750" Stroke on 402 / 4.000" Stroke on 427. Includes: UltraStreet Hydraulic Roller Cam, Rollmaster Billet Timing Set w/IWIS Chain & Torrington Bearing, Official GM Performance Chrome Timing Cover. Camshaft Installed, Degreed-In And Checked For Proper Stroker Clearance. Includes: UltraStreet Hydraulic Roller Cam, Rollmaster Billet Timing Set w/IWIS Chain & Torrington Bearing, Genuine GM Performance Chrome Timing Cover and Tavia Pointer, Hi-Performance Harmonic Balancer, SSRE/Moroso Street & Strip Oil Pan w/Passenger Side Dipstick, Hi-Performance Oil Pump w/Welded Pick-Up. All Gaskets, Seals And Hardware. Completely Assembled With Camshaft Degreed And TDC Verified And Set.